Life Is Strange is a frustrating little game. I hope it gets over its terrible twos. Life Is Strange is a troublesome little game. There are points when it delivers what was promised -- a sincere exploration of the trials of a girl transitioning into young adulthood -- and then there are points when what I'm witnessing feels a touch artificial in the game's presentations of various situations and a touch inhuman in its presentation of its characters. Episode 2, "Out of Time", picks up after the first hectic day that Max discovered her temporal powers. She wakes up and goes about her morning routine before heading off to meet up with her childhood friend, Chloe. From there, the two go out to test out Max's new superpowers and end up getting caught up in a bit of trouble. During this event, the subplot hinted in the previous episode, the appearance of a viral video of their fellow student Kate Marsh, erupts in a painful and devastating crisis. That's the outline of "Out of Time". I'm having trouble simply summing things up because the inconsistent quality of the game's presentation of these events and characters is also inconsistent in the measure in which they appear. From a rather strong opening in Max's dorm room, which lays some groundwork for what is to come, the episode moves on to a neat scene that take place at the town's diner between Max and Chloe's mom. This little interaction gives Max, as a character, a sense of history and grounding. Then Chloe enters, and the diner scene begins to shift intermittently between quaintly believable moments and moments that make one ask, "What planet are these people from?" I can't fault Life Is Strange too much, though, because these seemingly inhuman moments aren't grand faux pas. Rather the problem is the way that small things are acted out in such a way that always ends with me giving the game an uncertain sidewise glance. Things are off in terms of character behaviors that simply push these things into the realm of the uncanny valley. I say behavior and not decisions because the problem seems to lie in the presentation of the unconscious manner in which people execute actions once they've made a decision, rather than in the decisions that they make. Something is out of place, but this pervasive feeling was one whose source I couldn't identify. Then Max got a phone call in the game, and the issue became clear. This moment is so blatantly artificial, and it clarified to me why I was feeling uneasy earlier. Dontnod Entertainment is married to this idea of binary choice and the theme of balancing short term consequences against long term consequences --- so much so that they will force it even when it doesn't make logical sense. I feel the hands of the developers darting from behind the curtain and pushing characters into one another to create drama where there isn't any. As the player, I only catch a glimpse of the shadow of those hands out of the corner of my eye. Of course, I can forgive poor craftsmanship, hokey writing, and full on cheese in the face of sincerity. There's plenty of entertainment that I would never call great but that I still love because it is sincere and honest about itself. Indeed, I am criticizing Life Is Strange for its bizarre presentation of insincerity, yet I cannot fully lambaste the game because it has other scenes that are magnificently heartfelt. Later Max and Chloe will have a heart-to-heart in the junkyard after some rather overly stretched out, questionably inserted adventure game shenanigans. Incidentally, if Chloe doesn't turn out to be gay or bisexual, Dontnod is putting a hell of lot of effort into pointless subtext. It was a sweet scene and one that I hope that in the future the developers put effort into emulating that is then followed up by a puzzle concerning an oncoming train about to run over Chloe. As far as I can tell, this event is completely pointless to the story overall, but it got my adventure game nerd senses fawning over the rather neat structure of the whole thing. The final major scene is one that, structurally at least, makes me realize the brilliant effort going on beneath the hood of this game. Decisions have consequences, that has been the marketing for the Telltale-style adventure game since the beginning. However, usually it is a single decision in their games that ends up having a single effect or multiple related effects. Here, though, we are seeing an effort to create an outcome determined by the consequences of not one, but a handful of independent choices coming to fruition at the same time. Talking Kate down from a ledge in this scene is tied to a number of decisions, both big and small that were made during the first two episodes and leads to, reportedly, multiple different narrative paths that the game can go down. Yes, in the end, there are still the binary states of either “Kate lives” or “Kate dies", but the outcome has never been the main thrust of this style of game. It is about the way that we weave a narrative out of events in the game while on the road to reaching those outcomes. Later on in this episode, there is a meeting in the principal's office and the various differences that I've witnessed in this scene and that I have been told about make me think that this narrative design is going to be something that continues to build in complexity regarding the narrative paths that Life Is Strange can go down. 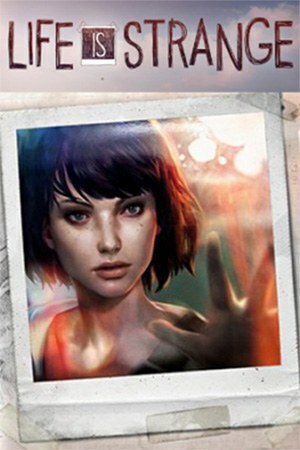 I don't know what to think of Life Is Strange as a whole. It is doing things that I really like, some of which I'm outright giddy over. It's also doing things that make me shift in my chair uncomfortably as I stare at something not quite human. The game is at least respectful of its heavier subject matter. However, while presenting its more common instances of teenage cruelty and teenage social interactions, I'm left once again wondering what pocket dimension I stepped into. Life Is Strange is a frustrating little game. I hope it gets over its terrible twos.